Did you know that Barbie is on the move? She’s leaving her multi-million dollar, three-storey, life-sized pink Barbie Dreamhouse in Malibu and she’s on the lookout for a new home. To entice Barbie to include Australia in her worldwide search for a new home, The Langham, Melbourne is holding a special event this April. The Barbie Dreamhouse Children’s Morning Tea will include a fabulously pink themed menu, guaranteed to delight Barbie fans. 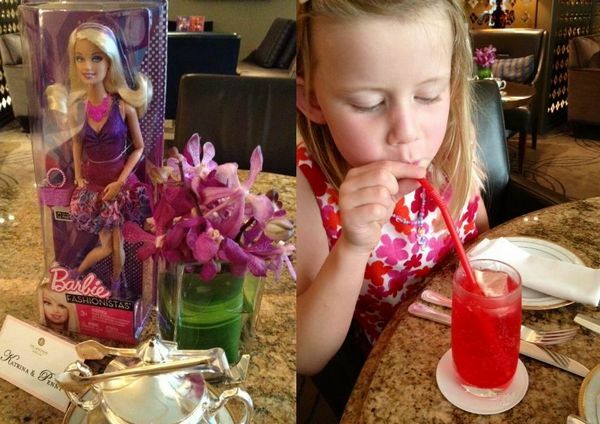 It was Barbie-pink-perfection from the moment we arrived at Aria Bar and Lounge at The Langham. 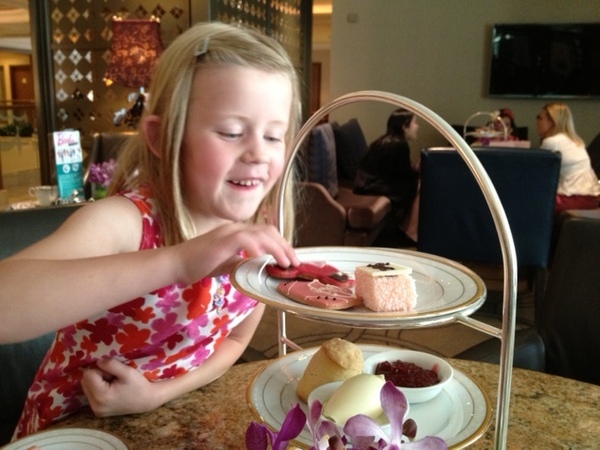 Our table was set with a fancy tea-service and, much to my daughter’s delight, a Barbie Fashionista Doll. 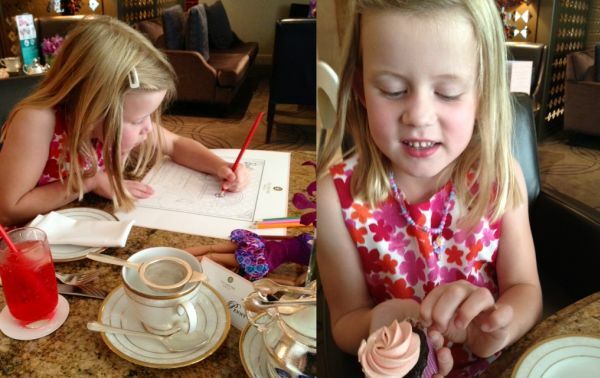 While I sat back and enjoyed the luxurious surrounds of the Aria Bar, my daughter sipped pink lemonade and got busy on some Barbie colouring activities. Of course, it was colouring pencils down when the food arrived! 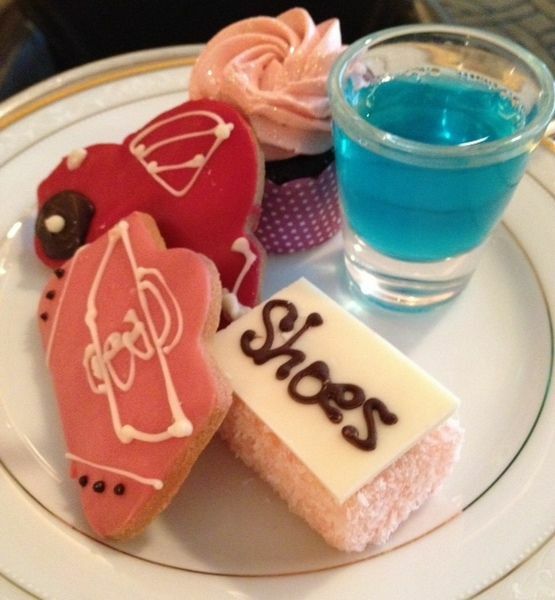 Where to begin with the wonderful treats?! My daughter started with the Malibu Beach Jelly Cup and moved on to the fairy bread and tiara sandwiches, all the while with her eye on the perfect biscuits and cakes – Barbie-inspired cookies in the shape of a handbag and Barbie’s car; a delectable pink lamington ‘Shoebox’, pink glittery cupcakes and those perennial teatime favourites, warm scones with jam and cream. Little guests can also have a hot chocolate (although we were sticking firmly to the pink lemonade!). Grown-ups are indulged with an amazing selection of sandwiches, freshly baked scones, dainty pastries and fruit tarts, and artful chocolate-dipped strawberries, all served on a tiered platter, with leaf tea, espresso or hot chocolate. When we were finished, my daughter sat back with a smile and said “Mum, they knew all about Barbie’s favourite foods!” (and kid’s favourites, too!). The Barbie Dreamhouse Children’s Tiffin is available in the Aria Bar and Lounge at The Langham, every weekday during the coming school holidays between April 1 and April 19 at 10am or noon. It costs $30 per child, or $45 with a Barbie Fashionista Doll to take home. 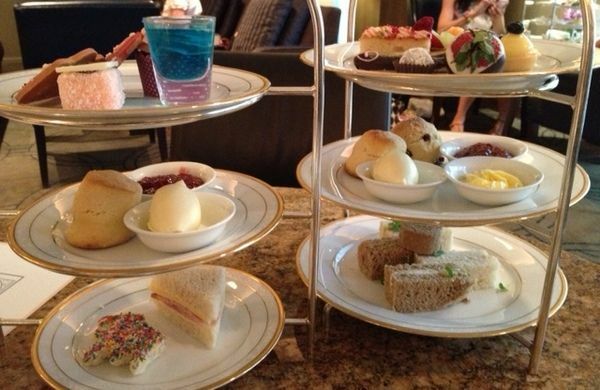 The Langham’s Classic Tiffin (for adults) is $49. The Langham is at Southbank in Melbourne, just a quick stroll over the pedestrian bridge from Flinders Street station. Bookings can be made by calling 1800 641 107 or online at Aria Bar and Lounge.